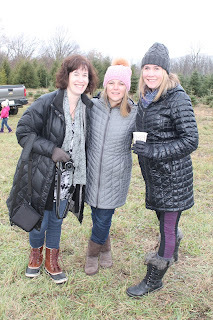 I know I've written before about our annual trek over to Indiana/Michigan to Dudeck's Tree Farm to cut down our Christmas tree with several good friends. It's a tradition we have kept up every year since 2001 for Tom and me. We added friends to our trip not long after and we've continued that tradition every year since then. 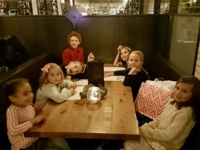 Our kids only remember going to Dudeck's - they all have since they were born. They don't know anything different. So this year imagine Peyton's disappointment when she learned that Austen's double header soccer game conflicted with our annual tree cutting. We were able to make some adjustments much to Peyton's delight (since she's told us that her new boyfriend is one of our friend's first grade sons so she definitely didn't want to miss our event and him!). The kids ate donuts, drank hot chocolate and delighted in playing a game of flag football while the adults caught up before hopping on the wagon to find our trees. They visited Santa - well, except for Hailey who still wouldn't go near Santa despite her constant talk about him beforehand. And, later Austen made us laugh when he spied Santa texting and announced it to all. (BTW, he still believes.) Peyton had the best reply - "I know why he is texting," she said. "He needs to tell the elves what we want for Christmas so they can get started" "That's exactly right," I said. Phew, saved by Peyton! Sadie also joined us for her first annual tree cutting. I don't really recall Adler's first tree cutting, but I didn't have three kids to keep track of back then either so I'm sure it was easier too . What I will remember is Sadie trying to eat the seat belts in the back of our car on the way there (thankfully, we were able to tuck them away after she only dug her teeth into the plastic buckle) and how excited she was to be there. Maybe a little too excited! However, what was really special was a moment that happened just before we left. A couple came over to talk to us about Sadie. 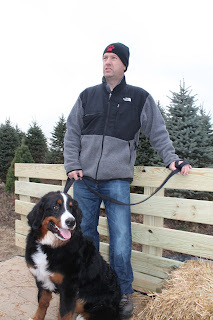 They said they also had a 4 year old Bernese Mountain Dog. I said well, this is our second one, we also had one before. They then asked if we brought her to the tree farm and we replied, yes, every year on this very weekend. "We met you then!" they said. She's the reason we got our Berner! It was because we met your dog so many years ago and vowed to get one too." Wow! What a special memory of our Adler girl. She lives on daily in so many ways. 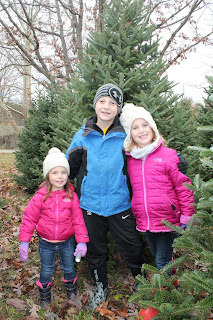 Anyway, we picked out our tree, Hailey enjoyed the horses pulling the wagons, Peyton liked hanging out with her "boyfriend," and Austen liked directing the little kids playing football. I love this tradition even though it hasn't always been easy with little kids and puppies underfoot but the memories we all have are ones that we know our kids will have forever. The girls. Where was Lisa? Sadie's first trip to the tree farm. More than eight years ago we met a special group of people. Austen wasn't even 2 when we walked into his classroom at the Montessori school he went to in the city for his new class orientation. One guy wore a white suit and another woman asked too many questions but little did we know that we would grow to be great friends - our kids AND us! 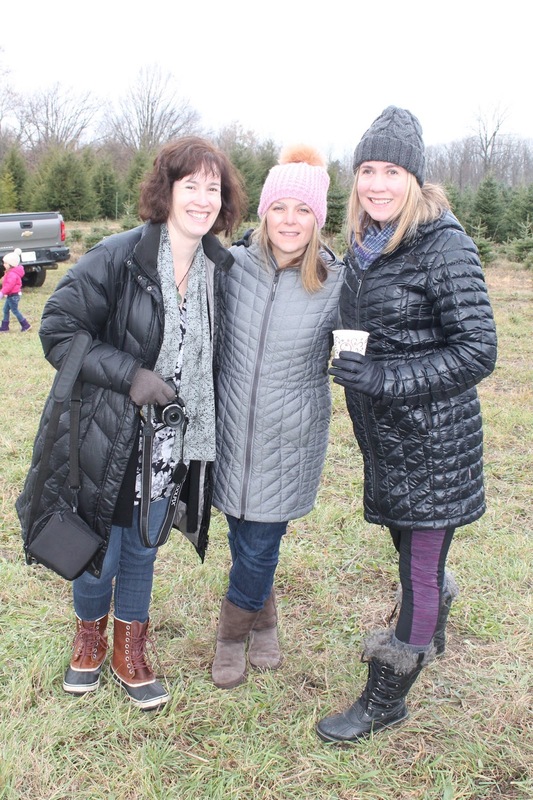 Bound by the friendship of our first borns and all in the same boat as full time working moms, we got together on New Year's, for Apple picking, birthday parties and to decorate cookies. We vacationed together, our kids shared their first sleepover, and some of us had our second kids together. Sadly, it was short lived. Everyone moved. One family to Sweden, another to Texas and two to the Chicago suburbs while one stayed in the city. However, every so often we still get together. Tonight it was to see the play "A Christmas Carol" at the Goodman Theatre in Chicago because Nate, one of Austen's friends in this group was playing Tiny Tim. Seven years later the kids still picked up where they left off after some initial shyness as they were all only 5 when everyone went their separate ways and our reunions aren't as frequent as we would like! I wish they all still went to the same school. We all have new parent friends now but nothing like we had together then when our kids were 2. I never thought I would write that but it's true. (Okay, the puppy ate Peyton's homework really.) It happened last Tuesday. Sadie has been gaining a little more freedom during the day when we've been out so I haven't been putting her in her crate - just confining her to part of the first floor. 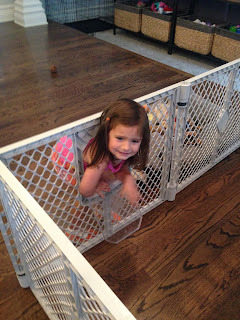 Overall she's been pretty good but apparently last week she entered the terrible twos. I came home to find all of the papers and books that I had left on the counter strewn about the floor and most of them were shredded. Thank God I returned the library books the day before but I quickly panicked as I scanned the floor for Peyton's blue homework packet. Oh no! Oh no! She had 75% of it done for the week already. Where was it?! I ran to the front hall and there before my eyes was tiny, shredded pieces of the blue homework packet. Nothing I could salvage or try to tape back together. Oh boy, what was I going to tell Peyton?! It took me about 20 minutes to clean up the mess and then email her teacher saying the dog ate her homework and I needed a new packet. Lucky for me she was the one that broke the news to Peyton and sent her home with a new packet which to my surprise she sat down and redid with little complaining. As for Sadie, she's grounded. Back in the crate for her when we are gone! Sadie used to have a pen that was in our kitchen when she was a bit smaller, but lately we've given her most of our main floor to roam even when we are away. Before this happened, Hailey used to like to play with the doggie door on the pen that Sadie used to fit through for only a few weeks when she was a smaller puppy. One afternoon, we had just finished lunch and I was busy cleaning up the dishes when I heard a little, "Mommy help me!" I couldn't see Hailey over our giant island that separated the voice from where I was at the sink so I walked around the island to see this! Obviously, I assessed the situation to make sure she wasn't in distress, but I couldn't help but chuckle and grab my camera phone so I could get this shot of her trying to squeeze herself through the doggie door. Oh Hailey - you crack us up with the things you do and say.